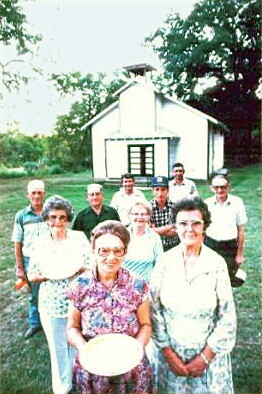 This photograph was taken at the first Champion School Reunion in 1984. In the front row with a smile and a pie is Esther Wrinkles who lived in downtown Champion at that time. The men in the back are from left to right. Herbert Hutchison, Manfred Smith, Tommy Sutherland, Doug Hutchison, Dwayne Henson, and George Tom Proctor. The three remaining ladies will be remembered and identified by Ruby Proctor or some other attendee at the next Champion School Reunion which will be held August 30th. This will be the twenty-fourth of these reunions and it is always pleasant to renew old acquaintances and catch up on the year’s news. In Champion the Labor Day celebration starts off with the Champion School Reunion, which is traditionally held on Saturday. People return to the old place so full of memories of precious days gone by, of good times and bad times of their youth now spent. They always pull someone along with them — some spouse or child or cousin or friend and then those persons have Champion as part of their lexicon of good experiences. Before you know it people who never darkened the door of the School are ‘reunionizing’ and reuniting from one end of town to the other year after year. Then some Champions who are great fans of Theodore Roosevelt say, “Bully!” Bridge players say, “What a Deal!” It is a Champion Notion! Saturday is also the traditional date for the Haden Family Reunion over in Ava. Champions hope to get some spill-over in the form of some visits from some Hadens and McCallies. Celebrating friends and family is a Champion notion no matter where it happens. The Sunday part of this Labor Day week-end is to be taken up with the usual Sunday Fair of Love and Gratitude. 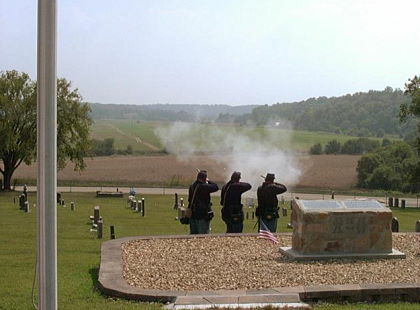 The Civil War Memorial will be dedicated at the Denlow Cemetery at two in the afternoon. Representatives of the Douglas County Historical and Genealogical Society will officiate in what promises to be an interesting and informative program. It would be a good idea to get there early so as not to miss any of the preliminary entertainment sure to be provided by the esteemed Alumni of Denlow U. Board members of Denlow Savings and Loan and National Indemnity Life Assurance of Denlow, LLC, as represented by the firm Upshaw, Upshot, and Unshod will also be on hand to oversee the propriety of the presentation. Jenna Kaitland Brixey and Kalyssa Ariel Wiseman will both celebrate their first birthday on Sunday, August 31st! It is amazing how quickly the year has passed and it is a delight to see the happy changes wrought in the lives of so many people by these delightful little girls. Love and Gratitude meets them wherever they go. Labor Day has been celebrated on the first Monday in September in the United States since the 1880s. Peter J. McGuire, general secretary of the Brotherhood of Carpenters and Joiners and a cofounder of the American Federation of Labor, was first in suggesting a day to honor those ‘who from rude nature have delved and carved all the grandeur we behold.” Someone else said that it was Matthew McGuire, a machinist, who first had the idea of a holiday. Anyway, the form for the celebration was outlined in the first proposal of the holiday—a street parade to exhibit to the public “the strength and esprit de corps of the trade and labor organizations.” When Monday rolls around the Champion Labor Day Parade will spontaneously erupt the way it does every year and in a short while the throngs will disburse to resume their orderly lives. What a Champion place! Americans also celebrate Labor Day as the symbolic end of summer. The summer was green and passed quickly. The fast green summer of Champion still leaves time for some planting and Linda’s Almanac from over at the Plant Place in Norwood indicates that the 3rd all the way through the 7th will be good for planting crops that bear above ground, particularly leafy vegetables. So much of gardening is just paying attention. The rest of it is hard work — It might require a thousand shovels of manure to get the plot ready, then maybe a thousand more! September’s Moon is the Harvest Moon and its birthstone is the sapphire. A gangly garden crooner with romance in his heart might woo successfully with, “The night was mighty dark, you could hardly see, because the moon refused to shine. There’s a couple sittin neath the willow tree. For Love they Pine. The little gal’s kind of scared of the dark, so she says, ‘I think I’ll go.’ The boy began to sigh. He looked up in the sky and told the Moon his little tale of woe. ‘Oh! Shine on shine on Harvest Moon up in the sky…” Or he might fall off the porch while he’s singing and get his foot stuck in a slop bucket and then get chased by a bad dog and knock a knot on his noggin and loose his hat on a low branch of a walnut tree and then roll his foot on a walnut and go sailing hip pocket over tea kettle and hit the ground flat of his back with the breath whooshing right out of him. Maybe he should just go home before he starts singing. Music is good medicine, but in some cases it ought to be applied sparingly. Perhaps a nice original poem written in a legible hand and folded neatly in a box with a pretty sapphire would do the trick. Wooing is tricky business in Champion as elsewhere and can easily turn into a calamity. Calamities come in many forms and they are almost always unbidden. Those many thousands of wounded soldiers from Iraq and Afghanistan certainly didn’t plan to live out their lives missing limbs, eyes, motor function or mental acuity. Some are making remarkable recoveries and some are not. They and all their families could use the support and understanding of a Grateful Nation that Loves them for their Sacrifice. On August 26, 1998 it was reported that Air Force Senior Airman Bryan J. Proctor had graduated from the Airman Leadership School at Yakota Air Base, Tokyo, Japan. He is the son of Pete and Kathy Proctor of Mountain Grove. At the Skyline Picnic this summer Pete reported that Brian is now a Staff Sergeant and that he has served multiple tours of duty in the Middle East where he is currently serving. “It’s my job,” he says. He’s a Champion. Part of the prize give-away at the Skyline VFD Picnic this summer was two Angel Food Packages. Foster Wiseman won one of them but the other one has not been claimed. Louise Hutchison has collected the food and has it on hand for the winner, but this person needs to contact her in order to make arrangements to pick it up. Her number is 948-2443. The certificate says: “Good for One Menu from the Angel Food Ministries donated by the Skyline Full Gospel Church.” It is quite a lot of food and it represents quite a generous donation made by Louise’s church organization. Champion notions or tricky business or examples of generosity can be reported to Champion Items, Rt. 2, Box 367, Norwood, MO 65717. Calamities of a romantic nature should be left untold, unless they are particularly humorous, then e-mail them to Champion News. Search the archives at www.championnews.us for references to Champion Parades. Think of some happy, uplifting song to sing on the porch at Henson’s Store on the North Side of the Square in Downtown Champion. Get those endorphins moving, but hold on to the porch railing and be sure that you’re Looking on the Bright Side! Champions are experts at living in the here and now. When the weather is perfect, they recognize it, neither comparing it to other perfect days or to less perfect days of the past. As to the future, there is every possibility that each of the coming days will be perfect and Champions are always ready to celebrate a beautiful day. “Celebrate” is the Champion word of the hour. The Champion School Reunion is coming up on Saturday, August 30. People will be coming from far and wide to get in on the fun. Old acquaintances will be renewed and nostalgia will mix with lots of good food for another memorable reunion. Locals are still reeling from the fun at the Skyline VFD Picnic. An e-mail came: “I really appreciated you plastering my picture holding one of my grandson’s all over the Douglas County Herald. Thank goodness you didn’t use my real name. 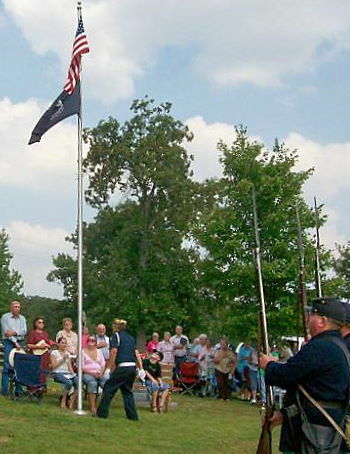 Now, for you to get on my good side again, would you place something in the Champion News about the Civil War Memorial dedication at the Denlow Cemetery on Sunday at 2 p.m. 31 Aug., 2008. 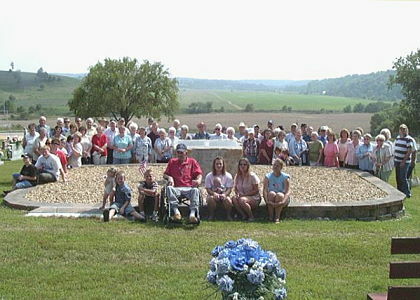 Thanks, General (Alias ).” The Memorial was scheduled to be dedicated back in May, but there was a hold up with the engraver and members of the Douglas County Historical and Genealogical Society wanted it to be just right. There are thirty Civil War veterans buried at Denlow—some from each side. That War ended in 1865, and 143 years later people in this part of the world are still honoring those who served—on both sides. War is still claiming lives of soldiers and still breaking hearts of those left behind. Love and Gratitude for their service is due them and their survivors no matter when they were lost. The current number of US service people to die in the current war is 4,143. Any Champion gardener who needs a lesson in humility need only go out to Western Spotted Hog and visit Linda’s garden. “Of course! That’s her business. She’s supposed to have a beautiful garden.” Well, boy howdy! She does. It is a veritable Cornucopia! It’s a journey. It’s a goal. It’s a process. It is a beautiful garden. Anyone who fights with jealousy, envy, and avarice ought to just stay home and pull some weeds. Linda’s Almanac from over at the Plant Place in Norwood says that the 20th and 21st will be good days to harvest crops and the 22nd and the 23rd will be excellent days for planting root crops. “Harvest” is a lovely word—the product of labor. Champions know they reap what they sow, so the malcontents and slackers can soothe their wounded spirits via shovel as they augment their little patches with some nice old well-rotted manure and hope for a better yield next time. What goes better with A than B? Alvin and Beverly have a pretty garden. They’ve got rocks balanced on rocks and some very tasty watermelons! They generously share their produce to the delight of Champion gardeners whose efforts have been less fruitful this season. It is a Champion kind of thing to do and a kind thing too. Charlie and Erma Cline were in the neighborhood over the week-end. They came down from Republic with Delmar and Cindy and rendezvoused with Dustin and Staci who were over from Seymour to visit her folks. So the place was full of Clines and that made it a pleasant place. Delmar has a beautiful singing voice and it is well known that singing is an uplifting activity. Singing can be a valuable skill to have. When a person wakes up in the middle of the night–mind racing from one worry to another and sleep is illusive, it is a good time to dredge up a long old song with lots of verses like “Poor Little Sadie.” “Poor Little Sadie is down from the Mountain, the orphanage took her away. Her Mama ran off with a revival preacher and her Daddy forgot how to pray. They scrubbed on her knees and her elbows. They cut off her long tangled hair. They turned a loose of her old dappled pony and loaded her into the car.” Well, it goes on and on and Sadie grows up learning the ways of the world. In her heart she longs for the peace and beauty of her old mountain home, but she never gets back there. It’s a sad song. Then there is “The Letter Edged in Black” and the “Lady and the Soldier” and a great number of ballads that speak of love, waiting and loss. Sad songs do a body about as much good as happy ones if the singing is heartfelt. If it is the middle of the night and other people are sleeping, a person can just imagine singing, or can just sing silently and think the words and tune. That way this person can imagine having an excellent singing voice, which may not be the case in the cold light of day. There is a wonderfully sad song called “Two Little Boys.” It’s a Civil War song about brothers who fought on different sides, but still loved each other. Hopefully it will not be sung at the dedication of the Memorial in Denlow. The General was so emotional over a song last May (“Hear that lonesome whippoorwill. He sounds too blue to fly.”) there is some speculation that the dedication was really put off on account of his histrionics. The community is alerted to his proclivities now, however, so perhaps a decorous ceremony can be expected. Somebody has suggested that a ‘webcam’ be installed in Champion so that misplaced Champions can look in on their old stomping grounds from their computers at any time to see what’s going on. They think they might be able to catch a parade or a rally on the Square. It is not very likely that the idea will get much play, since Champions are a live and let live lot and are respectful of the privacy of others. Besides, a contraption like that needs a sponsor and an administrator. Nobody like that lives around here. Old news is the best there is to be had. Some of it can be found at www.championnews.us. There is a picture of a tidy little garden there. Mrs. Violet Hinote shared some reports of her cruise to Alaska that she took with Lannie this summer. She said that they had a spectacular time. School is back in session and Lannie is riding loose heard on those eighth graders again. She does a great job with them and has a long list of people on whom she has been an excellent influence over the years. She is inspiring–such a Champion! Old news and any kind of Good news and reports of beautiful days are welcome at Champion Items, Rt. 2, Box 367, Norwood, MO 65717. Any kind of song that lifts the spirits and imparts courage or offers comfort is welcome at Champion News. Sing that song right out loud for maximum health benefit. If a person wants to sing especially loud, they ought to do it out on the porch at Henson’s Store in the heart of Champion’s thriving entertainment district. It’s on the North side of the Square where folks are always Looking on the Bright Side! Most often in Champion and neighboring like-minded communities the skeptics, pessimists, and harbingers of dreary outlooks are thwarted, disappointed and rebuffed. On Saturday a local Grump said, “I been looking at the radar and it shows that it’s raining buckets from West Springfield all the way South of Branson. It’s huge,” he said, “and it’s headed this away!” People came in from Marshfield and said it was really coming down over there. It was raining in Mountain Grove. “Steady.” But Wilburn said, “It’s gonna slide on West of us.” (Others said, “South.”) Anyway, Wilburn was right. He regularly proves himself to be somebody who makes a person want to listen. He says he talks over all his troubles with Sissy. So with all his ‘by-passes’ intact, he spent the week-end selling pop corn at the Skyline VFD Picnic. Saturday was the weather day in question, but it turned out to be a fantastic evening. The temperature was lovely and the crowd was immense. The event can be chalked up as another grand success and already plans are in the works for next year. Mrs. Ruby Proctor enjoyed the Skyline Picnic and was happy to meet up with old friends and family that she doesn’t get to see very often. She reported that she had recently had a visit with Janet Housley Spellman and Sue Housley Arnall. They are the daughters of Ruby’s old school chums, William Housley and Jeanette McClellan Housley. She went to school with William at Mint Springs and with Jeanette at Champion. Janet and Sue now live in Springfield and it is a real treat for Ruby when they come out to visit with her. The eighth day of the eighth month of two thousand eight was the fortieth birthday of Roger Wiseman! Fosters old dad is reaching his age of majority. He is aging nicely and following the good example of his own parents and that of his Champion in-laws. It is a reassuring idea that people who are almost middle aged now are the same people who were paying attention to the old folks as they were growing up. It’s a Champion notion! There is a guy out on 76 Highway who has recently sold his place to some folks from the Carolinas. They will be moving and taking possession of the property in December. It sounds like they are nice folks and they are optimistic about their move. Someone said that they are part of the first wave of thirty thousand people who call themselves “Believers” who will be moving to this area from the Carolinas before the year 2012. That is an auspicious date in the Mayan calendar when it is thought by these folks that there will be cataclysmic occurrences that will cause the Ozarks to be the New Eastern Seaboard. They say that there will be many people from the current Eastern Seaboard who will migrate to this area in the next few years so now might be a good time to be in the real estate business. The Lenape Indians that were displaced by white settlers in the East came here in the 1600’s. (See Searching for Booger County by Sandy Ray Chapin.) They fought with and then lived with the Osage who were already here and together they fought more settlers from the East. Four hundred years later settlers are still coming, but these days they find the Ozarks more hospitable. In the five years since the war in Iraq began seventy US Service Personnel from Missouri have lost their lives there. The latest is Specialist Kevin R. Dixon of Steelville, MO who died August 2nd. 4,138 is now the official death toll of US. The number of wounded may never be known. Including US service people and all the other members of the Coalition and the Iraqi people, the number must be phenomenal. It is to be hoped that the living are being recognized by someone with Love and Gratitude. Semus Heffern, grandson of Sue and Bob, got into a yellow jacket nest recently when he was out with his folks on a camping trip. It was no fun at all. The weather was hot and they were far from home. It is not likely to be something he will forget and certainly nothing he will want to repeat. He is seven years old already! Time is flying by! The General was reported to have been on best behavior at the Skyline Picnic. Once again, happily, the bagpipes were locked in the trunk of the car and the keys were ‘temporarily’ lost so he was unable to take part musically in the Flag Raising ceremony presented by the America Legion. The worst he was seen doing was influencing some innocent youngsters. Their parents are well acquainted with the General, however, and will have some input to ameliorate any damage that he might do to their young psyches. Linda’s Almanac from over at the Plant Place in Norwood says that the 14th and 15th will be good days to plant above-ground crops. There is one Old Champion Girl who is thrilled to know that what she thought was the same non-bearing, ornamental, dwarf okra that she grew last year has decided to take off and make a few pods! She may get a crop yet. There are mixed reports of garden successes around the area. Some folks are having bumper crops and some are having bummers. Verla Meers from up in Springfield says that they are having to mow their grass too often these days on account of all the rain. Someone else was remarking that by this time of the year usually things are brown and crunchy underfoot. Champion in August, 2008, is a lush, verdant wonderland and there are some very beautiful and tidy little gardens in the neighborhood. There are some great musicians and singers in the neighborhood too. Bands playing at the Skyline Picnic Friday and Saturday nights dedicated songs to the memory of Benny Pool, who passed away August 4th. He was very well regarded in the community and was an accomplished guitar and bass player who performed with Booger County Bluegrass for a number of years. There is a ‘link’ on the www.championnews.us site to the Missouri Department of Conservation all about Missouri’s toads and frogs. There are pictures, descriptions, information about habitat and recordings of their peeps, trills, whistles, grunts and snores. It is very interesting to see which frog makes which of the various sounds heard at night in these parts. A healthy population of frogs is indicative of clean and healthy water. It is fun, some say, to imitate the frog sounds at night to see if the frogs can be fooled. The eastern gray treefrog has a birdlike, musical trill that can be approximated with a little practice. The good health benefits of singing are also available to frog imitators. So go sit on the porch at Henson’s Store in city-centre Champion and try to fool a frog while releasing some of those good endorphins. Also while there admire the most tidy and beautiful little garden in Champion. Mail music and lyrics to any good frog songs to Champion Items, Rt. 2, Box 367, Norwood, MO 65717. E-mail them or any pertinences concerning singing frogs, stray dogs, garden produce and any prognostications of weather or cataclysmic occurrences to Champion News. Don’t forget, if you’re a Champion, you’re Looking on the Bright Side!